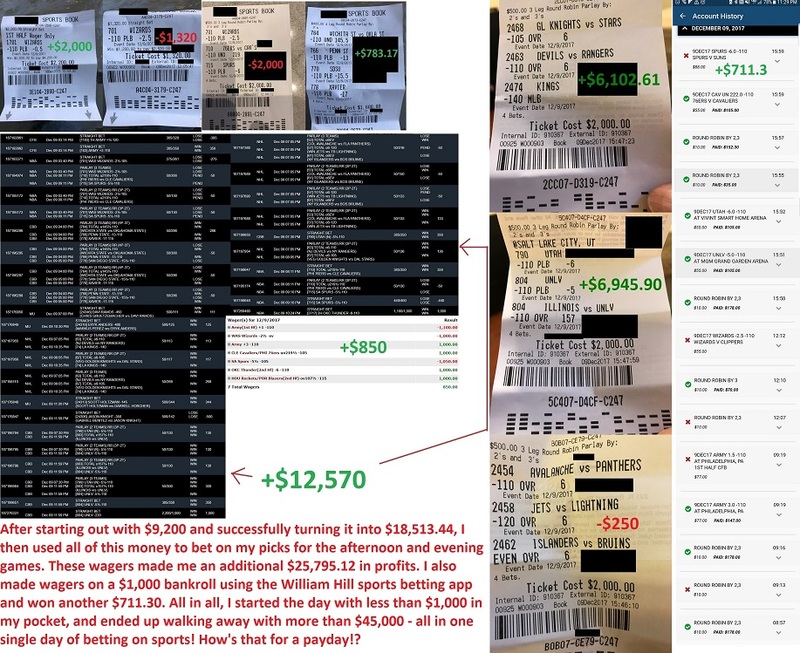 Here’s How I Turned $9,200 into $45,000 in Just One Day of Betting on Sports! What a great weekend for me. In just one single day of betting on sports, I started the day with just $9,200 in my hands, and ended up walking away over $45,000! On Saturday, I started the day with $9,200 in my pockets. I used all $9,200 to bet on the morning games. I ended up winning 2 Round Robins and one straight bet, turning $9,200 into $18,513.44! Next, I used this new bankroll to wager on the afternoon and evening games. These new wagers brought in an additional $25,795.12 in profits. 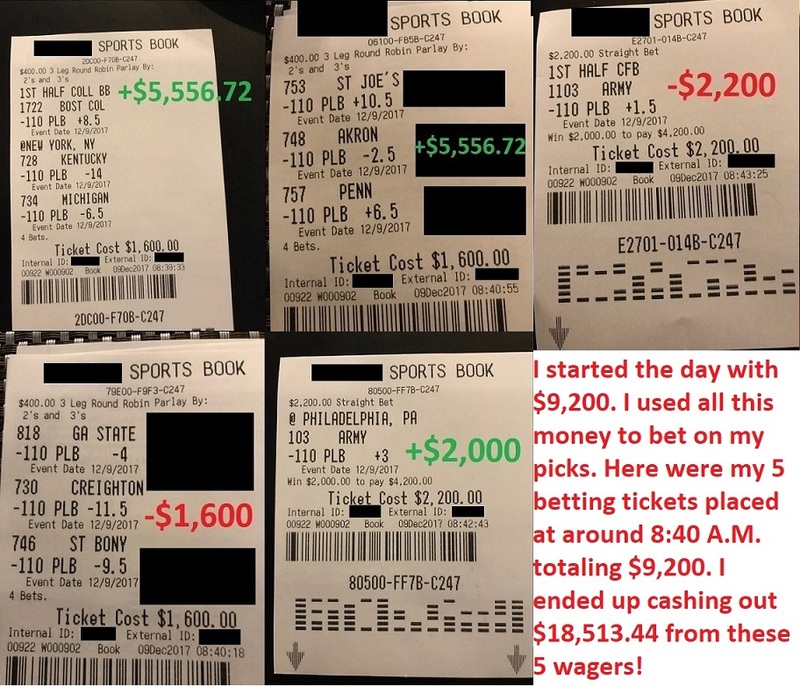 All in all, I started the day with under $1,000 in my hands, and ended up walking away with over $45,000 – all in one single day of betting on sports! I’m not afraid to display all of my tickets and results for you because I know that historically, I have always ended up far ahead at the end of each ride. Plus, it’s far more compelling for you to see the actual results than just to hear some theoretical or hypothetical results. The performance so far is crystal clear: My Round Robin picks are up in units across all sports. Today, I will maintain my acceleration at 3 units per parlay. Over the last week, I have wagered approximately $150,000 on my own picks. As always, I continue to put my money where my mouth is by betting over $100K each week on all of the picks I share with you. Common sense will tell you that the only reason why I continue to fire away and bet tens of thousands a day on my own picks is because I feel certain about winning out. That’s the differentiation between me and everyone else: While the typical touts are great at just sitting back and telling you how they can win…I would rather go out there and bet hundreds of thousands of dollars a week on my own picks to prove to you that I can win. So I encourage you to judge me not just based on what I say, but based on what I do. It’s one thing for me to tell you that I can win. It’s truly something else to actually see me put money where my mouth is and show you that I can win. Right now, I’m rigorously working in a process that could possibly get me back in action as the largest sports bettor in Nevada once again by 2018. I’ll keep you updated on this as it happens. I know that the more I bet, the more I can win. It’s my goal to continually bet millions of dollars on my own picks every single week to show you what kind of winnings can be made from this craft when playing at the highest level. After a strong winning weekend, I will accelerate hard to 3 units per parlay today. If the patterns continue to hold, you could very well see me win $100,000 in one day very soon. I can’t wait for you to see it firsthand.